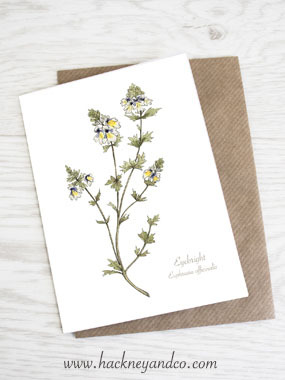 Eyebright is a native British and European plant that has naturalised in many other areas of the world including Canada and the U.S. Eyebright is a semiparasitic plant meaning that it is nourished by the roots of other plants. This annual plant has been used as a folk medicine to treat eye inflammations and infections, coughs, and poor memory since the Middle Ages. 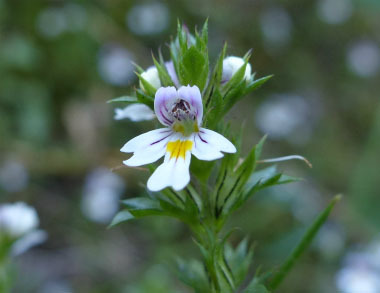 Eyebright is a genus of about 450 species of herbaceous flowering plants in the family Orobanchaceae. 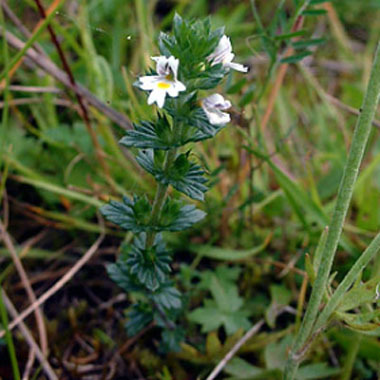 Distinguishing Features: Eyebright can be identified by its small, oval-shaped leaves, and small white or lilac flowers. The flowers have a black center, and purple streaks on the petals with a central yellow spot. It can be hard to spot as sometimes this plant does not grow very high and unless it is in bloom it blends in with other plants. 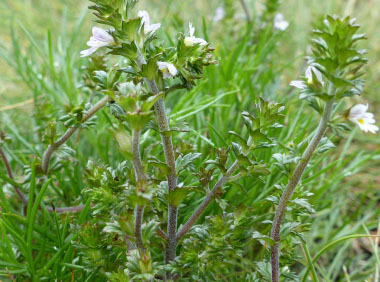 Flowers: Eyebright flowers are primarily white, or lilac with purple-veins. The corolla is two-lipped, its lower, tube-like portion being enclosed in a green calyx, tipped with four teeth. The upper lip is two-lobed and arches over the stamens forming a shelter-like structure. The lower lip is spreading and three-lobed, each lobe being notched. A yellow patch emphasizes the central lobe and purple 'honey guides' on both upper and lower lips - marked streaks of colour - point the way down the throat. It has four stamens, with brown, downy anthers. It blooms from June to September. 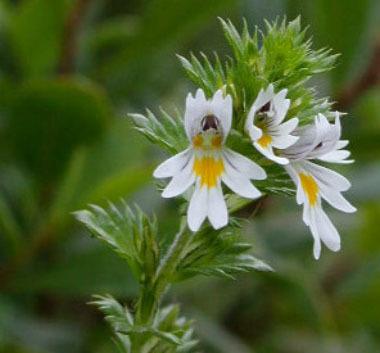 Fields of Nutrition has medicinal benefits and vitamin/mineral content of Eyebright. 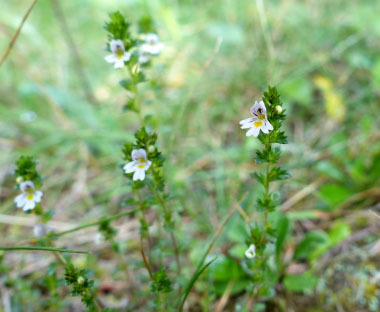 Leaves: Eyebright leaves are usually between 1/2 to 1 cm (1/6” to ½”) long and roughly .6cm ( ¼”) wide. 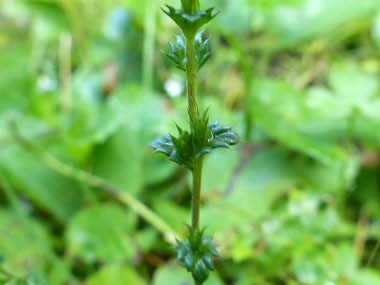 Some of the leaves are narrow and pointed at the end, while others are more rounded at the tip. The leaves grow along with the stem in opposite pairs. Height: This is a very small plant that grows anywhere from 10 to 25cm ( 4-10”). 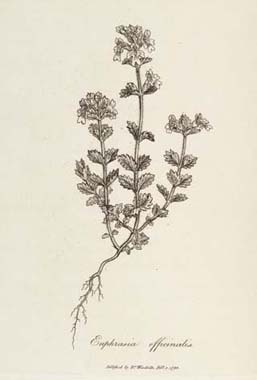 The stem is erect and wiry, either unbranched in smaller plants, or with several opposite branches in the taller plants. 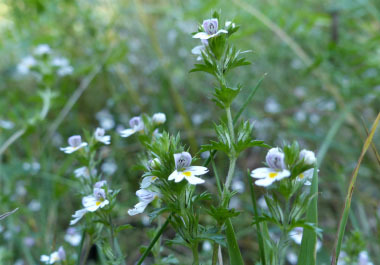 Habitat: Eyebright can be found throughout North America, Europe, Northern and Western Asia. It prefers grassy areas and meadows. Eyebrights are found in alpine or sub-alpine meadows where snow is common. Edible parts: The stems, leaves and flowers are all edible.